Cazenovia College’s alumni, faculty, friends, parents, staff, students, and trustees will come together October 23, 2015 for a special day in the history of the College as they celebrate the successful conclusion of the College’s first comprehensive fundraising initiative, Building Futures One at a Time: The Campaign for Cazenovia College. The daylong festivities will culminate with a fireworks display that may be viewed by the public from Lakeland Park, beginning at approximately 7:00 p.m. on Friday, October 23. 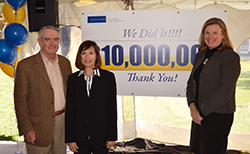 The five-year campaign raised almost $10.8 million for three capital projects including Christakos Field, updated Science Labs, and a historical-building renovation on Jephson Campus. In addition, gifts to the College’s endowment have increased academic and scholarship support for faculty and students. Important to the success of the campaign has been the relationship between the community and the institution, as many donors live in the greater Cazenovia area and/or work at the College. In turn, the College is an essential component of the local economy.